The company was certified for the first time according to ISO 9001:1994 and EN 46 000: 1996 by the British certifying company BVQI (Bureau Veritas Quality International). 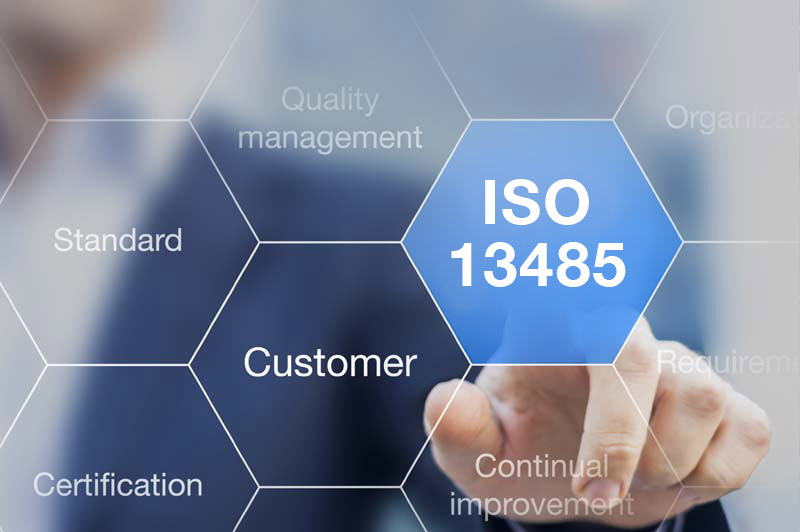 The company is currently certified according to EN ISO 13485:2016. 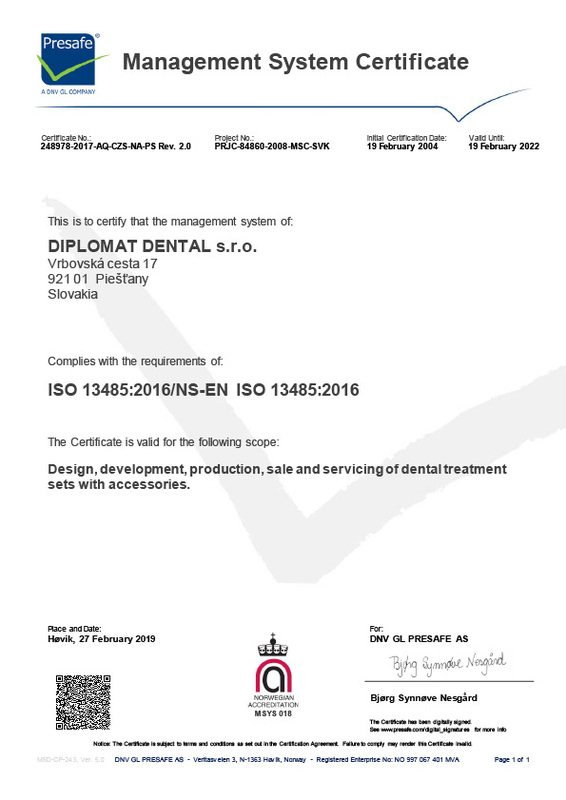 The certified system of quality, high technical level and particularly reliability and safety are the attributes of the DIPLOMAT DENTAL s.r.o. manufacturer of dental equipment. 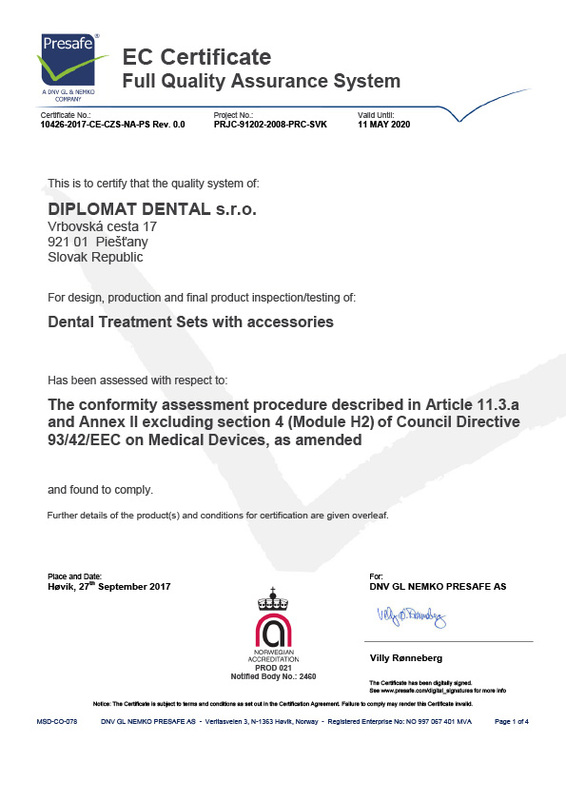 In order to test if the requirements of the technical and legal regulations have been met, the product certification is performed by the certification authority EVPÚ, a.s. Nová Dubnica. The obtained certificate authorizing the use of the mark “CE” (Conformité Européene) on our products was the entrance ticket to Europe. The company DIPLOMAT DENTAL s.r.o. 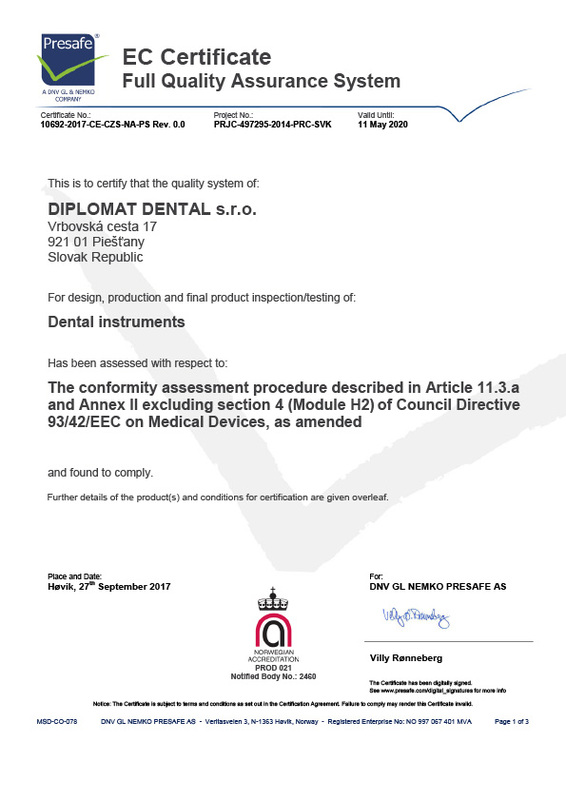 was the first manufacturer of medical technical equipment in Slovakia to obtain authorization to use the CE mark. Patients and the users may be assured that the products of the company DIPLOMAT DENTAL s.r.o. marked by the CE mark (the conformity mark CE 2460 issued by the independent certification company DNV GL NEMKO PRESAFE AS) were adequately reviewed for their compliance with the strict requirements of the European Union for safety and protection defined in the “Medical Devices Directive” 93/42/EEC-Revision 2007/47/EEC.